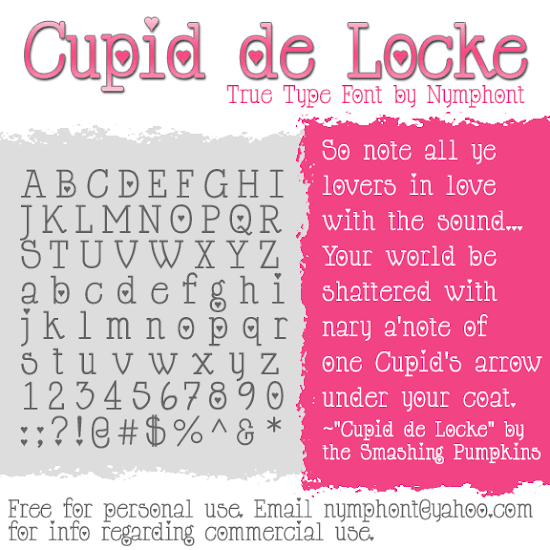 Presenting, "Cupid de Locke," a whimsical font inspired by the Smashing Pumpkins song of the same name. The font is a fun rendition of my existing HappyPhantom font, where heart accents have been added to large "counters" in many letters, and replace traditional "dots" within punctuation. The download is licensed free for personal use. Commercial use of this font requires a donation. Donations for the license to use this font commercially can be placed via PayPal using any major credit card, and do not require a PayPal account. Click here if you would like to donate. Email me nymphont@yahoo.com if you have any questions or need any assistance. The first release of this font, was November 14, 2009. The font contains a total of 333 characters and the download is in zip format. You can read more about the creation process of this font and my HappyPhantom fonts in my post The Chickenhawk Chronicles: Preface.